That period between Christmas and New Years where no one really knows what day it is or what they should be doing. A time where the Turkey has either since been devoured or is still clinging on to the hope of one last sandwich. I for one had my fill of roasted meats and craved some spice so I headed to an old favourite in Ballyhackamore, the long-standing Mandarin City. My parents have been taking me to 'The Mandarin' since the restaurant opened back in 1999 something which quickly became a Wednesday evening ritual. It's, therefore, fair to say I've probably dined here hundreds of times before. The decor is and always has been traditional Chinese albeit with a hint of affluence informing customers that there is more on offer than chicken curry and chips. The menu's offerings are broad with all the expected popular dishes plus many authentic dishes which perhaps may be absent in more modest Chinese eateries. 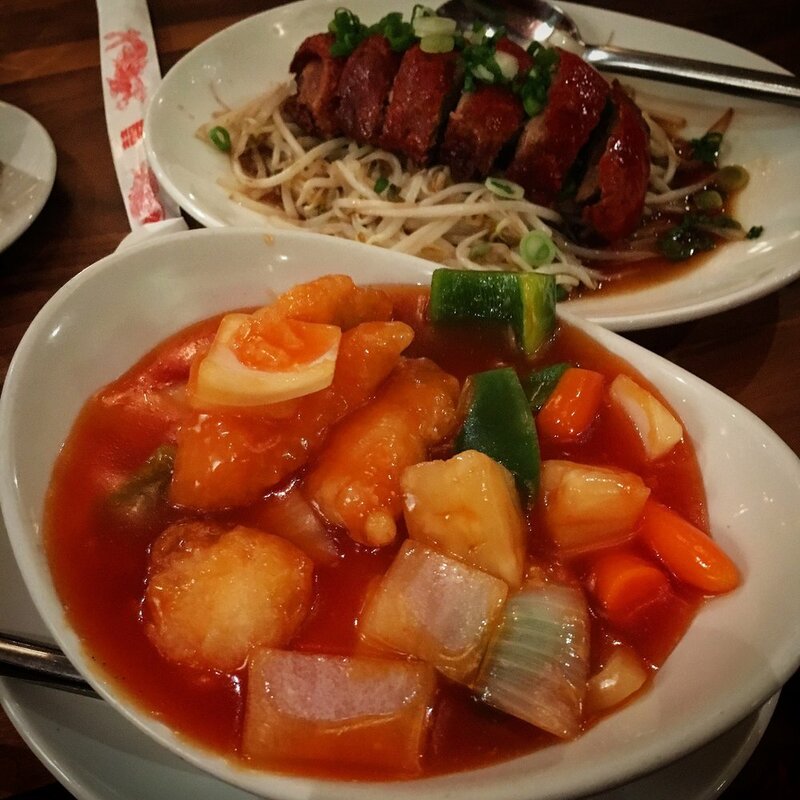 Due to the extensive menus at most Chinese restaurants naturally, there are some dishes that appeal more than others meaning it usually takes a few visits to each restaurant to know the lay of the land. Having been to the Mandarin many times I know their Salt & Chilli Tiger prawns are probably the best in the country and at £22 they should be. Unfortunately, on this occasion, I had to forego the prawns due to my wife's aversion to chill and I didn't fancy tackling a portion with only a fussy two-year-old as back up. Taste wise the starters were at either end of the flavour spectrum. A chicken and sweet corn soup (mostly for the two-year-old) and a deep fried Malay spicy satay chicken. Don't get me wrong I like chicken and sweet corn soup and this was probably as good as chicken and sweetcorn soup gets. Significant chunks of chicken and a base made from excellently flavoursome chicken stock. All very pleasant to warm the taste buds up for what was next and in my opinion the nicest dish of the meal. The deep fried Malay spicy satay chicken was a bit of a surprise. I have a huge fondness for satay especially when it's laced with chilli. The chunks of chicken were bright red hinting at a marinade which was evident when bit into. The spicy satay sauce was a revelation and thankfully my wife's aversion to chilli worked in my favour this time meaning I had the dish to myself. The sauce was not for the faint hearted with the classic peanut taste complimenting the intense chilli. One of the nicest starters I have had in a while. For mains, I opted for the obligatory Cantonese Roast Duck which was served on a bed of decorative bean sprouts and soy sauce. As a fan of Sweet and Sour I have had the king prawn version here many times but the Monkfish combination got the vote this time round. The roast duck was a tad dry for my liking. Considering the promptness of the courses arrival after ordering I suspect it may have been reheated to order. Having said that the skin was excellently crisp and as a whole provided ok flavour when smothered in curry sauce. However, it wasn't a patch on the roast duck of the Lee Garden (Botanic). Initial thoughts on the monkfish was that it was fairly heavy on the vinegar. Thankfully I don't mind vinegar so this didn't really bother me. I prefer my sweet and sour more on the sour side. The monkfish was coated in a light batter that absorbed the sauce and complimented the meaty fish excellently well. Overall I think the Mandarin City is still a destination in the East of the City. Consistently good 7/10 food but at £70 (including tip) for a meal for two it may be considered to be on the pricey side.